We all know social media has become an important part of our lives, even our businesses. Yet many leaders are reluctant to join social media and begin using it to enhance their reach. Why is it people are scared of social media? That’s what Bobby Umar and I discuss in this episode of the Answers From Leadership podcast. 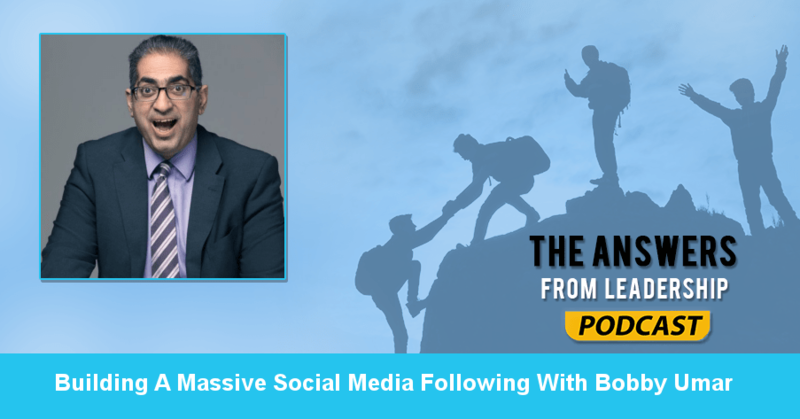 I dig deep with Bobby, a social media wizard who has close to half a million followers, about the dangers and benefits of social media, what one can do to quickly grow their social media following, and more. Is there anything else you’d like listeners to know about you? You got that pretty well. I focus on networking, personal branding, and social media. Those are the things that I care about. And helping stuck or lost leaders and people who feel unfulfilled. That’s what I do. In your helping of leaders, do you have a definition of leadership? Yeah, there’s lots of variables in how people define leadership. I would define leadership as anything and everything you do to evolve as a person to better yourself and better your teams and better the world. How has social media impacted your leadership? The biggest thing that social media has done for me is to amplify the reach of my voice and my content/message. The second thing it has helped me build a huge thought-leadership brand. I think I’ve had more impact with social media. Social media has been huge in building a legacy. Yeah, everyone now has a lot of access to people. Especially Twitter. On Facebook or LinkedIn, you don’t have Lady Gaga or Barrack Obama’s phone number but you can hit them up on Twitter. You can say “Hey, what’s up? !” And sometimes sports stars, actors, and politicians will respond. What are some tips or tricks to grow your social media presence? The first thing is to understand your objective. Are you trying to grow your business? Are you trying to become a well-known parenting expert? Or do you have some sort of message for the world? The second thing is to understand who the target is. For me, I target people who feel lost, stuck, or unfulfilled in their personal or professional life. Once you have your target, it’s about a couple of things. The first one is content. So, what are you creating? Creating ideas. Creating content that inspires people. Building a network of people. And then finding ways to continually hone your craft to get better. Is there an easy way to find your target on Facebook or Twitter? For example, let’s say you’re a real estate guy. On Twitter, there’s ways to find people who do real estate. You toss in the hashtag #RealEstate and hashtag the name of the city and then you’ll see people. Begin following them and engaging them. You can buy Facebook ads and target specific people. It narrows your target down. Is there a right way or a wrong way to use hashtags? Hashtags are fun. People love to hashtag stuff. Those hashtags are for fun. They’re not strategic. You should be sharing content and using established hashtags for your target. If I hashtag leadership, career, inspiration, whatever it is… Millions of people are looking at that hashtag. Hashtags get eyeballs of people outside of your followers. How do you find established hashtags? Just google them. You can find a list of established hashtags for any industry. Some of the popular hashtags I use are #Fail, #CustServe, #Sales, #Business, #SmallBiz… There’s just tons of them. The same thing applies to Instagram. You can Google the popular hashtags. Instagram and Twitter are the two biggest places where hashtags are really relevant. Hashtagging can go wrong on social media. Is there anything else that can go wrong on social media? You can say something stupid. A lot of people are afraid of social media because they’re afraid of saying something stupid. Well, they should! Think of social media as a schoolyard. Here I am in the corner with my friends. That’s Facebook. Here I am with my business group. That’s LinkedIn. Okay, you know what? I’m going to get up on a soapbox and yell “I like this!” That’s Twitter. So it’s a schoolyard. On the schoolyard playground, people will do and say things that upset you. And social media is real life. It should upset you. What are some of the positive aspects of social media? The positive aspects are tremendous! Having a voice that’s amplified to impact people. Inspirational stories that get spread. Videos with 44 million hits that will make you laugh or entertain or inspire you. That to me is phenomenal. Having small businesses or small causes or individuals being able to leverage social media to get the help or support or resources they need. Every individual has the opportunity to crowdsource their information. And the connections. Some of my favorite people I haven’t met in real life. You mentioned there are divisive people on social media. How do you handle negative people? Do you defriend them or try to bridge the divide? I gave him one more chance to apologize and he didn’t. I had to block him after that. 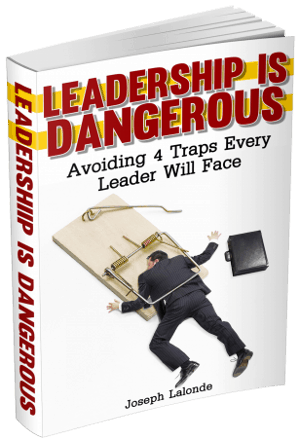 Is there a book that’s impacted your leadership? It’s a question I get a lot. I’m going to tell you the truth. I’m not a big reader. The second way is experiential. You go and do it. The third way is what I call conversational. I meet someone who’s an expert and I talk to him. And I learn a lot. I learn by experiential and talking to people. That’s been the greatest gift in how I learn. Honestly, the greatest book that’s taught me about leadership has been the Harry Potter series. The themes of love and choosing the light over the dark… Oh man, there’s so much there! Let’s go back to the way you learn. You said you learn from conversations. Who’s one person that’s impacted your leadership? There’s two people. One is my official mentor Ron Tite. He’s a speaker and into comedy. Nick Kusmich was my business coach. And I met with them, one after the other, and they told me the same thing. What do you wish you would have known about leadership in your early 20’s? I wish I would have known I could have been a leader early on. I wasn’t thinking about those things. The second thing is to have known it’s okay to choose a path of success that works for you as opposed to following the path defined by other people. Do you have any parting words of wisdom as we wrap up our chat? It’s okay to feel lost or stuck. It’s not okay to do nothing about it. If a listener wants to connect with you, where would they find you? My website is http://raeallan.com/. You can find me on my Facebook business page or Twitter. I also do a daily LinkedIn tip. You will also find I run an exclusive Facebook group called Power Of Connection.